In 2016 id Software decided to remake the classic, DOOM, published by Bethesda. I recently decided to revisit the game, and man I forgot how fun it is. It’s exactly what you would want it to be, loud music, lots of gore, and fast-paced action. The game follows the titular character from the series, Doom Slayer, as he wakes up in a facility on Mars. Researchers at the facility have been tapping into the energy of Hell via Mars to power humanity. Unsurprisingly, messing around with Hell energy made some people go a little crazy and start worshiping the demons. Olivia, one such person, made a pact and actually opened a portal to Hell thus leading to the facility being overrun and things going nuts. Doom Slayer (also brought from Hell) wakes up and is guided through the facility by one of the head researchers, Samuel Hayden. Their ultimate goals differ in that Hayden wants to get the facility under control and keep using Hell power. Doom Slayer wants not only to close the portal but completely cut Hell off once again. It is a serviceable plot, not dull, but not exactly complex or surprising. In truth, the plot of DOOM is secondary to everything else happening. It’s entertaining enough to watch scenes unfold, and had it been bad it would have hurt the game, but you aren’t really here for the plot. It does what it needs to do and does it well, in the end, that’s all it has to be. What DOOM is actually about is the combat. Many enemies that fans of the original will recognize are here, and there are plenty of them to kill. 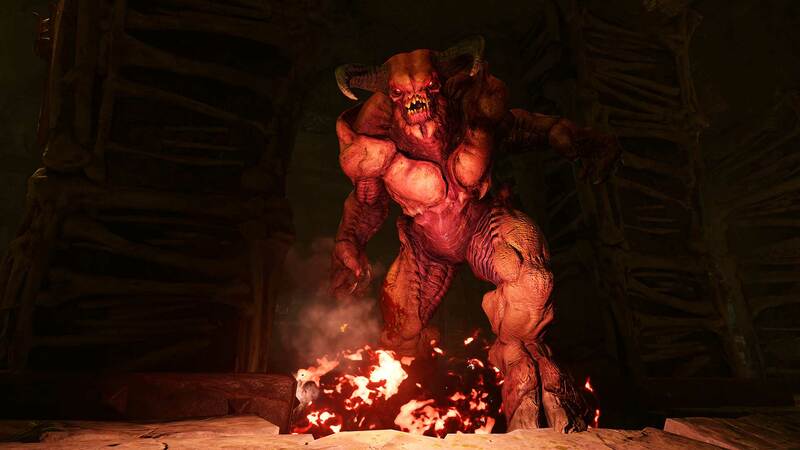 DOOM pushes gamers to move forward quickly and continuously engage. Taking things slowly is not really the point of DOOM, and the game itself actively rewards you for engagement. A developer at id Software referred to it as “push forward” combat. You are rewarded with health and ammo for constantly engaging and taking your time will often lead to being overwhelmed. That is not to say there are no tactics to the game. Choosing when to go for health, what weapons you should use, when you should go for power-ups and when to leave them on the field for later, all matter. You might find yourself overwhelmed by smaller enemies and relying on power-ups or guns like the BFG to clear the field at times, only to realize that you’ve left yourself vulnerable for larger enemies in the same location right after. Or you might horde your powerful weapons/ammo to realize you’ve made things more difficult for yourself and the chance to use them has passed. Either way learning the different battles and changing up your tactics will help in the end. The game is fast, but it won’t let you get away with being lazy or not thinking. The game gives you a decent number of weapons, though not as many as some might have expected. There are two upgrades for most weapons that you can switch between to change up fighting style, but for the most part, people will pick a favorite and stick with it. You have a pistol that doesn’t require ammo to help out, but with its weakness, it often ends up being more of a problem than a help. I would have liked to see more weapons in the game, but there are enough that it’s not disappointing, just felt a bit of variety might have been nice. You also have two “special” weapons. The chainsaw and the fan favorite The BFG. Ammo for both are rare, and they aren’t in the weapon wheel, rather have an assigned button. However, they are instant kills on almost anything. The chainsaw requires a larger amount of stockpiled ammo to instant kill some of the bigger enemies, but if it’s full there is no reason not to use it if you are in trouble. Conversely, The BFG simply targets and spreads out to kill multiple enemies. How strong the enemies are, determines how many it will kill. They are both fantastic, and it’s tempting to overuse them. DOOM also added glory kills. If you damage an enemy enough, it will start flashing, and you can melee them for a special kill. Doing so gives you ammo, and is super helpful in a pinch, but honestly, the glory of glory kills is how they look. They are graphic and fantastic. Which brings us to how the game looks. 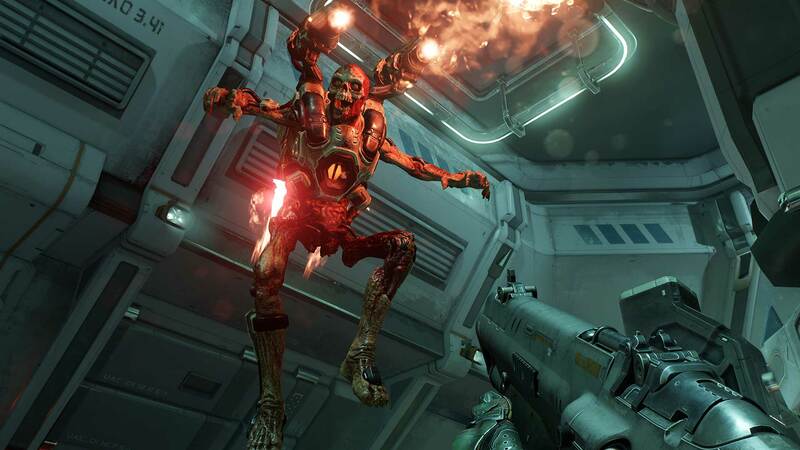 DOOM is exactly what you would want. The locations themselves could use a little work in the sequel, but the enemies look great, and the gore and destruction are fantastic. It sounds pretty horrible to say but this game is a gory mess, and I absolutist love it. It also sounds great. It has, in my opinion, the perfect soundtrack. If you are in battle, you will be treated to loud metal music, and it fits to a tee. It gets you in the mood for the speed of the game and helps just to amplify the whole experience. The voice acting is limited, but well done, and the sound effects are on point. I have two issues with this game. One there is a lot of platforming for an FPS, it’s not needed, and more often than not it’s annoying. I think adding the jumping was something the developers got excited as a “new” feature for the series and overdid it. Two is multiplayer. My experience with it is limited because I was mostly disappointed. Since Call of Duty Modern Warfare there has been a shift in MP in shooter games, no longer are weapons and power-ups spread on the map, and you find them. No, you play, get points, level, and build load outs. This works so well for some games, but it has completely taken over, and I am tired of it. DOOM needed to have multiplayer more in line with the original and multiplayer games from that era. Ranking should have been limited to help balance out skill, and the gameplay should have been more like Halo 3 or more importantly old school DOOM and Quake. This is my honest and full opinion and a hill in which I will die. That is not to say MP is completely bad, it’s not, just that it is a feature I mostly ignored because I just didn’t enjoy it. Bottom line if you haven’t played DOOM by now you are making a big mistake, or you know just really hate this type of game. It’s fun, it’s fast, it’s action heavy, it’s brilliant. It is everything it needs to be and is a great game to play while maybe taking a break from your longer slower paced epics. For my money, it remains one of the most enjoyable FPSs at least of this generation, if not overall. It managed to honor the original games while still making its own way, and I cannot wait for the sequel to come out later this year (hopefully).